If you sell to interior designers, architects, property directors and managers specializing in retail and commercial interior design, and to shopfitters, interior fit-out specialists and interior contractors, Advertising with Shop Spec is an extremely effective way to reach new customers, develop your business and expand your market. 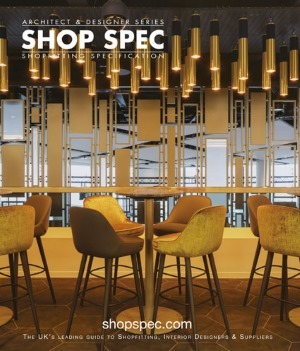 Shop Spec combines digital and print media to create the UK's leading reference guide for retail and commercial interior designers, specifiers, architects, retailers, property managers, shopfitters and interior contractors that source and specify products and services. Shop Spec is both a web site and a hard copy publication and advertisers receive coverage across both formats. Hotels, bars, clubs, restaurants and leisure projects. As a specifying tool, this essential guide provides an extremely effective environment in which to advertise. With a reach in excess of 7,000 active designers and specifiers, attracting more than 5,000 visitors per month, Shop Spec is used by key decision makers responsible for commissioning, developing and fitting of todays retail, commercial and public sector environments. The purchasing power these specifiers command is vast and by combining the convenience of the web with the aesthetic of the printed page, Shop Spec informs and inspires, providing the perfect environment for your advertising. Benefit from the immediacy & convenience of the web site combined with the aesthetic and visual impact of the printed page, both platforms working together to deliver maximum impact. For more information on how advertising with Shop Spec can help develop your business, download the media kit and/or contact Gordon Green on +44 (0)1697 343147 or gordon.green@purplems.com. Not listed on Shop Spec? If you are a supplier or manufacture of interior product, retail and display equipment or provide interior fit-out or design services getting listed on Shop Spec is easy. For just £75 your company will receive an Enhanced Listing for 12 months and be seen by thousands of interior designers, specifiers and retailers across the UK. Highlighted positioning in all relevant searches. Outstanding value costing less than 21p per day and after 12 months if you don't renew you will receive a free basic entry. To book your position today contact Gordon Green on +44 (0)1697 343147 or gordon.green@purplems.com.